Product #16056 | SKU W77IR | 0.0 (no ratings yet) Thanks for your rating! The 77mm T1 Infrared Filter from Tiffen is a high-tech filter targeted towards eliminating infrared contamination at 680nm. This filter will assist you in maintaining your colour spectrum when shooting against a dark fabric. You will notice the blacks turn out true with no colour cast from the red end of the spectrum. 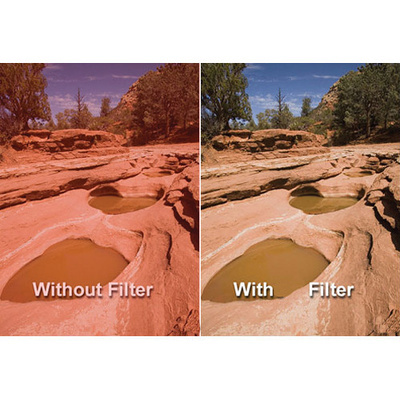 This filter has been created to help capture a much broader spectrum of colour than previous infrared filters - particularly with digital camcorders. Colour shift is a critical factor in digital photography especially when dealing with the infrared spectrum - and even more important when shooting with HD technology. Unlike traditional film cameras, CCD or CMOS sensors of a digital camera are, by nature, susceptible to infrared contamination. Manufacturers try to avoid this problem by incorporating an infrared absorbing filter on top of the image sensor. Because these filters do not have a sharp cutoff at the infrared wavelengths there has to be a compromise in order not to exclude visible red wavelengths. Despite these precautions, some infrared wavelengths pass through resulting in contamination of the image. Tiffen's Water White glass, using their ColorCore Technology, is characterised by a high transmission quality. Typically, it will transmit 98-99% of the light. It also features an anti-glare and anti-reflective quality that makes it useful in a wide range of uses including the movie theatre industry, store and art displays. The glass is virtually defect-free and is becoming more and more prevalent in digital equipment.